Minimize the time-intensive process of managing your team's timesheets data. Eliminate paper timesheets and manual entry errors. Using BuildingBlok, your field teams can clock-in and clock-out directly from the jobsite, using any device, at any time. GPS location tracking ensures your workers are at the correct location, at the right time, every time. Hours worked are easily submitted to any project via the web or the BuildingBlok Timesheets app. 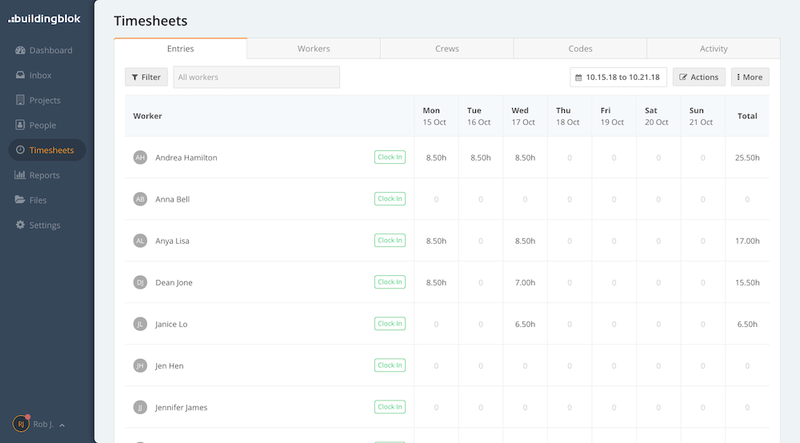 Workers can be grouped into “crews” so managers can easily perform bulk clock-ins and clock-outs. GPS tracking technology records the location of each worker when they clock-in and-out. Submit timesheets via our mobile app – even when you’re offline. Gain insight and streamline communications with our robust built-in reports. Integrations with Quickbooks, Timberline, and Xero accounting are coming soon! Timesheets is definitely my favorite tool in BuildingBlok. The Timesheets tool has allowed our business to easily track and manage our employees' time cards, as well as accurately account for job costing. I do really appreciate the responsiveness of the customer service/tech support agents and the chat feature is super convenient. The Timesheets tool is in step with modern technology. The tool works on any smartphone which everyone carries these days. With this tool we can see daily the time everyone spent on any particular job which helps a great deal with the scheduling. The timesheets tool completely eliminates the old school paper copy. By using this tool the employees don't have to return to the office to turn in their time cards which saves on travel time and cost.